Strawberries For Strawberry Lovers-Home of the World's Happiest Fruit! 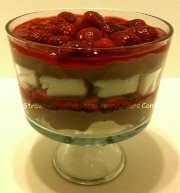 Strawberry enthusiasts, this site is for YOU! Strawberries add joy to any day... that's why we love them! Whatever your craving is, satisfy it here! 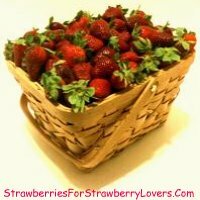 A Large Basket of Juicy Strawberries! Home of the World's Happiest Fruit! Welcome! In this place, those who love strawberries can discover lots and lots of new ways to add these tasty sweets to their lives! Whether you're looking for information on how to care for them; how to prepare them; their history and they've influenced culture; interesting facts for a school report (or just for fun! ); how they might impact your health; or just how to relax and celebrate life with them, you're sure to find something useful. And you can share your berry love, too! There are many opportunities for family-friendly interaction. "Like" and "Share" buttons are conveniently located on every page of the site, and all the images can be "Pinned". Of course, you are always welcome to simply copy-and-paste the web address for your favorite page into a social site posting, e-mail, blog post, etc. Also, a Facebook comment area is provided at the bottom of each page. Please write about anything you find interesting, or have any questions about. That way, you can share your fondness for the little red gems right here on this site! Let the world know what you're thinking! Please feel free to share this site with everyone you think might enjoy it! Thank you very much for your support! Whatever your reason for coming here, and whatever pages you visit while at this site, I hope that you will find these good-things-in-small-packages as fascinating as I do; and that you will enjoy this site as much as I have enjoyed building it.